What happens after I meet my 2019 Medicare Part D plan's $5,100 TrOOP threshold (total out-of-pocket drug spending limit)? 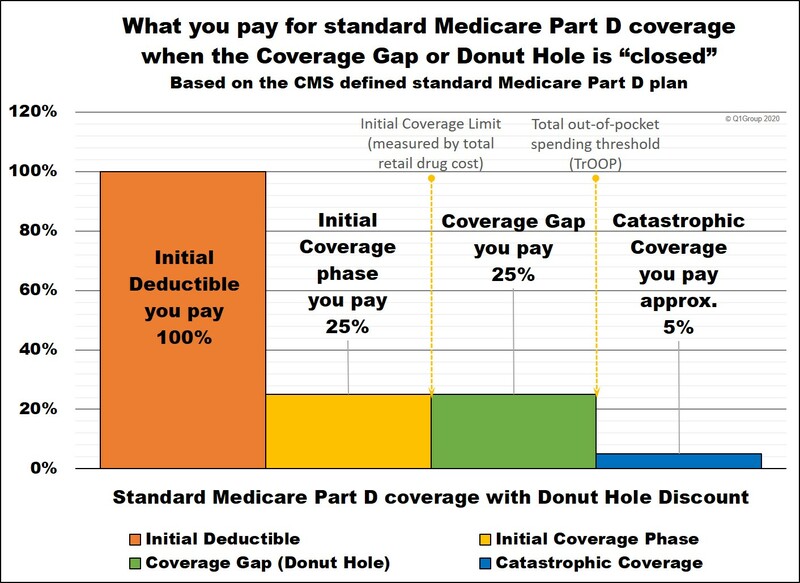 You exit the Coverage Gap (or Donut Hole) and enter into the Catastrophic Coverage phase of your Medicare Part D coverage - and remain in Catastrophic Coverage for the remainder of the plan year (until December 31st). Medicare Part D Catastrophic Coverage is the fourth and final phase of your Medicare Part D prescription drug plan coverage. You reach Catastrophic Coverage after you meet your Medicare Part D prescription drug plan's annual out-of-pocket spending limit (TrOOP). So, once TrOOP is met, you exit the Coverage Gap phase (Donut Hole) and enter the Catastrophic Coverage phase. Question: Will my drug costs in the Catastrophic Coverage phase depend on my chosen Medicare Part D plan? Yes. Your Catastrophic Coverage costs are calculated based on your plan's retail drug prices - and retail drug prices can vary plan-to-plan. In the Catastrophic Coverage phase, all Medicare Part D plans use the same cost-sharing structure (you pay the higher of 5% of retail or an annual fixed cost ($3.40 for generics or multi-source preferred drug or $8.50 )). So you may pay more for your drugs in Catastrophic Coverage if your Medicare prescription drug plan has higher negotiated retail drug prices as compared to someone who is in a Medicare Part D plan with lower negotiated drug costs. all other drugs (such as brand-name, single-source drugs) — In 2019, you will pay the greater of $8.50 OR 5% of the plan's negotiated retail drug cost for medication. In other words, in 2019, you would be charged $3.40 for those generic or preferred multi-source drugs with a retail price under $68 and 5% of the plan's negotiated retail drug price for those drugs with a retail price greater than $68 and, for all other formulary drugs, you would pay $8.50 for drugs with a retail price under $170 and 5% for those with a retail price over $170. As a 2019 example, if you are using a brand-name, single-source formulary drug with a retail cost of $100, you would pay $8.50 as a co-pay for the drug in the Catastrophic Coverage phase because ... 5% of $100 = $5.00 and since $8.50 is greater than $5.00 - you pay the higher amount. As stated above, the 2019 brand-name drug Catastrophic Coverage cost-sharing is $8.50 or 5% of the retail drug cost, whichever is higher. Question: Does my Medicare Part D coverage have a maximum out-of-pocket (MOOP) limit? No. Unfortunately, your Medicare Part D prescription drug coverage does not have a maximum annual spending limit. Your annual out-of-pocket costs for Medicare Part D coverage are theoretically unlimited. Cost-sharing in the Catastrophic Coverage phase changes slightly year-to-year. The chart below shows the cost-sharing for the Catastrophic Coverage phase over the past few years. You can click the plan year to see examples and more details for a specific year or click here to see a chart of Medicare Part D plan parameters for all years since 2006. Question: Will I get Catastrophic Coverage for non-formulary drugs? No. Please keep in mind that the Catastrophic Coverage phase cost-sharing only applies to medications that are on your Part D plan's formulary (drug list). Therefore, if you are prescribed medication that is not covered on your Medicare Part D formulary, you will be responsible for 100% of the drug's cost - even when in the Catastrophic Coverage phase of your Medicare Part D plan coverage. If you have a non-formulary medication, you may wish to request a formulary exception and ask to have your medication added to your formulary so that it will be covered during all phases of your Medicare Part D coverage. How your cost-sharing changes in each phase of your Medicare Part D plan coverage. Here is how example formulary drug purchases are calculated throughout your 2019 Medicare Part D plan (using the CMS defined standard benefit Medicare Part D plan as a guide). Have a question? Click here to let us know.